Gansu (甘肃) Province is in China's northwest. It borders Xinjiang Autonomous Region, Qinghai, Sichuan, Shaanxi, Ningxia, Inner Mongolia, and Mongolia. The capital city is Lanzhou (兰州) through which the Yellow River passes. While home to some of China's most notable Silk Road history and incredible ancient sites as well as UNESCO World Heritage Sites, Gansu is one of China's more underdeveloped and poorest provinces. You can learn more about Gansu's location with these maps of China's mainland provinces. Gansu's weather is one of extremes. While more temperate in the southern part of the province, in the northwestern region around Dunhuang, the climate is extreme. This area begins the reaches of the Gobi Desert so you'll experience extreme cold in the winters and heat in the summers in this arid landscape. The most pleasant times of year are spring and fall when the temperatures don't reach extreme points. Many visitors make Dunhuang their entry and exit point for Gansu but if you don't get to the southern part of the province, notably Lanzhou, you'll miss one of China's greatest provincial museums. There are also a large number of Tibetan Buddhist areas and attractions in the southern part of the province. Dunhuang is best connected by air to Xi'an and many Silk Road itineraries start in Xi'an with Dunhuang as its second stop. Dunhuang and Lanzhou are connected by rail and air with rail being convenient with overnight routes. Flight connections are less regular and can be seasonal. There are direct flights from many major Chinese cities to Lanzhou. Depending on your itinerary in Gansu, you'll probably want to look into hiring a car and driver if not also a guide. While in cities, you can easily use taxis but many major sights are located outside city centers. In Dunhuang, to see the Mogao Caves, Yadan Geological Park, and the Yumenguan, you will certainly need some transportation. You may think the main (and only) attraction was the world-famous UNESCO-listed Mogao Grottoes. While these caves full of ancient Buddhist art are an incredible attraction, there is much more to see in Gansu Province. 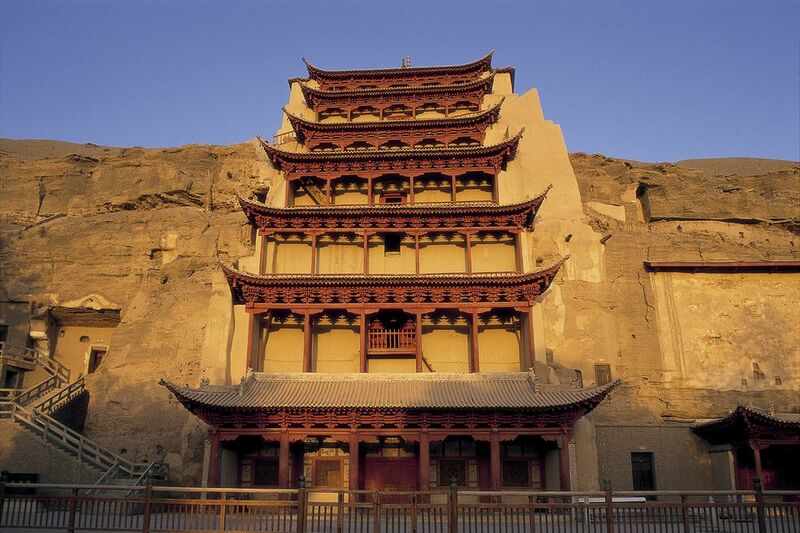 Here is a breakdown of many of the famous sites throughout the Gansu Province.